Vendor of Siensor AF107 is Siensor. The Siensor AF107 liquid level sensor is an intelligent device designed for accurate measurement of fuel level in vehicle tanks and stationary reservoirs (diesel-generators, boiler plants, oil storages, etc.). Siensor AF107 measures fuel level, converts received value into an analog or frequency signal and then transmits data to the terminal, which indicates it in litres or percentage. 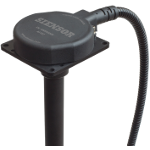 Siensor AF107 is a reliable sensor featuring a long-term service. The manufacturer's limited warranty is valid for five years from date of purchase. Siensor AF107 provides flexible configuration of limit values and output signal properties. Output signal does not depend on power supply voltage and therefore the sensor can be integrated with any navigation terminal, which has a frequency or voltage measurement input. Siensor AF107 is compatible with most liquid types. On request, it is possible to order the product with the length of a measuring probe different from the original one. Data processing algorithms enable high-accuracy detection of fuel filling, draining and consumption. *the sensor can take measurements, but with reduced accuracy.